PYJ, as he is affectionately called by some, has always defended that he has done nothing wrong for people to be beating war crimes drums behind him. “God knows that people are after me for no reason, war crimes court, we will grab this man, we will do this one here, if my people abandon me, they make me vulnerable,” PYJ said on Sunday, October 14, when he preached at his Christ Chapel of Faith Ministries. Preaching on the theme, “God is the Chief Navigator,” from Proverbs 16:1-4 and John 15:7, PYJ, who is dubbed the ‘Godfather’ of Nimba County, boasted that the people of that county will never leave or abandon him. “So Nimba County will never leave me; Nimba County is very grateful to me. Nimba County will always stand behind me in everything,” he boasted of his backing by his kinsmen and women. Preaching his sermon, he equated himself to David in the Bible, who fought for Israel, defeated Goliath and the Israelites made him their leader, saying he fought for Nimba County and the people made him their Senator. According to him, God has destined him to lead the people of Nimba and when this mission he’s on is over, God will speak to him in his dream and tell him to quit. He disclosed that God called him for one purpose: to come and save his people. According to him, when Ellen Sirleaf-Johnson-led Unity Party dumped him in Saclepea during the 2005 elections, Nimba County, his people, took him from the dust of defeat, removed the shame from him and made him Senator. When PYJ led his band of trigger happy, mass murdering rebel movement, more than half of his fighters, including child soldiers, were his kinsmen, who were predominantly from the Gio and Mano ethnic groups. Most people accuse him of being personally responsible for executing innocent civilians, whom he had some trivial issues with. He is also overwhelmingly blamed for the death of former President Samuel Kanyan Doe, whose Krahn ethnic group and that of his, were at each other’s throats during the years of civil war. The disagreement between the people of Grand Gedeh where the Krahns are predominant and Nimba goes far back as 1985 when President Doe sent soldiers of the Armed Forces of Liberia (AFL) after a failed coup attempt on his life and government. The coup plotters, including PYJ himself, were led by General Thomas Quiwonkpa, a son from Nimba County. Many war crimes court campaigners — international and local — including Hassan Bility, are calling on the international community to pressure the George Weah-led administration to establish a war crimes or a special court to bring to book those responsible for crimes against humanity and war crimes during Liberia’s 14-year civil war. Most people usually point fingers at Senator PYJ whenever the discussions of accounting for war deeds are being talked about. This in some way has made the Nimba Senator uneasy, making him to be home by latest 5 p.m. daily, even though has said that he’s not afraid of anything or anyone. “On the President’s birthday, we were eating and once it was quarter to five, I told the President that I had to leave and he said ‘Mr. Senator, I know your time, you can go.’ I can’t stay out behind five o-clock. I don’t go to club, I don’t go chasing women, I don’t drink beer, so those who fornicate, those who drink, they want to attack me. This body [of mine] belongs to the Holy Spirit,” he emphasized as his congregation applauded him. President Weah’s Congress for Democratic Change now Coalition for Democratic Change (CDC), was a leading advocate for the establishment of the war crimes court when they were in opposition. Its party chairman, Mulbah Morlu, led many protest actions aimed at setting up the war crimes court. But since assuming state power, the party has changed their tone on the court’s establishment, arguing that the peace that Liberia now enjoys is fragile. But during the 2017 Presidential runoff election of which President Weah and former Vice President Joseph Boakai were candidates, it is said that PYJ did a secret pact with Weah for him (Prince) to campaign and win Nimba over to him (Weah) so that should he (Weah) win, his government won’t push for the establishment of a war crimes court in the country. 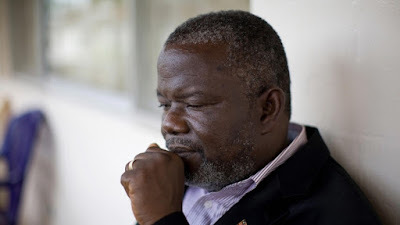 In 2012, PYJ told the British Broadcasting Corporation’s (BBC) Network Africa that he couldn’t put his support behind Weah’s CDC because they had promised that if they had won, they would have established the war crimes court. Because he doesn’t want to face a court of any sort, so he doesn’t support any group advocating for such. When he preached on Sunday, he told his audience that he and his Nimba people are fully supporting George Weah; adding: “He is our leader for 12 years. Yes!” Meanwhile, this administration, right now, has a six-year constitutional mandate, not 12. Touching on the trending issue of the alleged missing L$16 billion, he assured that the money issue will be resolved. “If they are the ones who took the money and they are bringing America and other people to investigate that’s it but it will be resolved. He accused a colleague from District 5 in the county for what he said “incitement against the government.” According to him, this lawmaker, whom he didn’t name, had recently appeared on the radio in Nimba and blasted the government for stealing the L$16 billion. “God wants to use this President as a vessel to elevate this country to higher grounds of prosperity,” PYJ disclosed. He, however, assured the President that the plan from the oppositions will come to nothing, only if he (Weah) puts God in the front to navigate his way. He further described the members of the opposition community as nothing but “chicken feathers,” who only want to destroy.